Hiya guys! Love is in the air. I'm in full lovey dovey mode with all these Valentine releases. I'm like the Oprah of pelvic thrusts, haha. Weirdness aside, there are some gorgeous collections coming out this year. 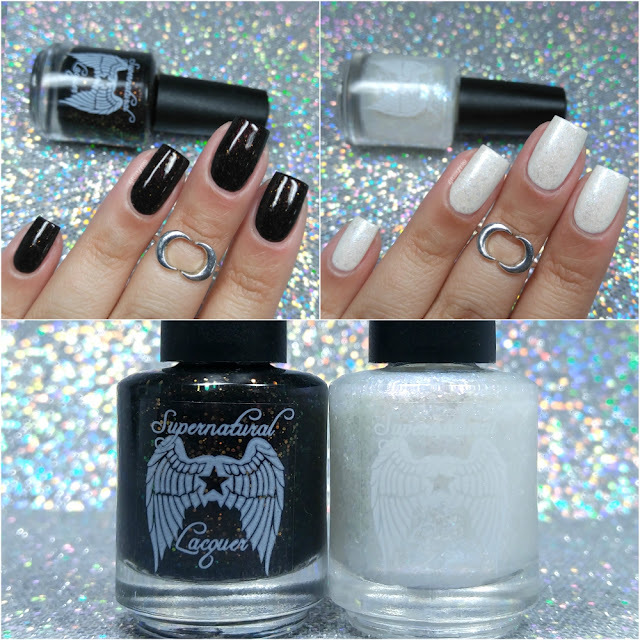 For today I'm sharing swatches for the Dothraki Valentine's Duo by Supernatural Lacquer. The duo is inspired by the couple Khal Drogo and Khaleesi from Game of Thrones. While I'm not a huge fan of the show, I do know enough to know that I adore these two together. Now let's get to the swatches! The Dothraki Valentine's Duo by Supernatural Lacquer releases tonight Friday, Jan 27th for preorder through the 29th at 9pm EST. The full-size duo will retail for $14 or $8 for each. Be sure to use my coupon code MM10 for 10% off your order! My Sun and My Stars can be described as a black base with red shimmer and gold-orange to green-blue shifting glitters. I love how the orange/gold flakes just light up this black shade. It almost looks like embers shining in the dark. So much more gorgeous in person! The formula has a sheer application, but builds up easily for an opaque finish. It has a good consistency for layering, not too thick or too thin. Lots and lots of glitter per brush stroke for even coverage as well. It does dry down to a slightly textured finish, but smooths out perfectly with a thick layer of topcoat. Shown here in two coats and sealed with a glossy topcoat. Moon of my Life can be described as a blue-to-magenta color-shifting iridescent flakie shimmer. This is a clear based shade, so if worn alone your nail line will peek through. I really wanted to wear this by itself, but I had a smurf attack my nail beds and the results were not pretty. Of course, this looks absolutely stunning over a black base as well. I'm glad I swatched this over the white instead though, it gives the polish a ethereal pearlescent look. The formula has a smooth application, easy to manage and layer over a base. If you'd like to wear it by itself, then I suggest using three coats to get decent coverage. It dries minimally gritty and smooths down with topcoat. Shown over a white base in two coats and sealed with a glossy topcoat. Overall I think this is such a great duo, really unique and different for Valentine's Day. Plus I love that it was inspired by a fandom, I always feel those make the best polishes. To recap, the Dothraki Valentine's Duo by Supernatural Lacquer releases tonight Friday, Jan 27th for preorder through the 29th at 9pm EST. The full-size duo will retail for $14 or $8 for each. Be sure to use my coupon code MM10 for 10% off your order! Moon of my life looks very pretty ! Lovely photos!! I can't get over 'My Sun and My Stars'! It's a very interesting color!